We are located in the South East corner of Queensland, Australia 40 minutes from the heart of Brisbane. 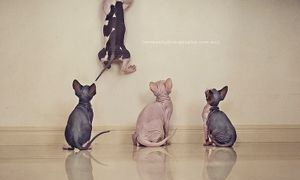 Sphynx are an active and intelligent companion who make their presence known by their desire to interact with human family members and visitors alike. They are not a breed suited to everyone as they crave human attention and are not suitable for those looking for a docile cat. Our aim is to breed for health, conformation and temperament. Please note that all information such as pricing and availability is included on this website. 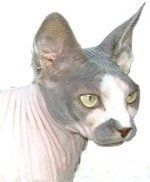 Now also DNA testing for Sphynx and Devon Rex Congenital Myasthenic Syndrome (CMS) - known as devon spasticity, as well as testing for Sphynx and Devon Rex Coats. Kittens are placed in homes with copies of all relevant health test results and Veterinary Health Certificates.